Before going any further, we should all remember Savita’s husband Parveen Halappanavar in our thoughts and prayers. Today, the date that the inquest returned its verdict of medical misadventure following the death of his wife, they should have been celebrating their fifth wedding anniversary together with their newborn baby girl due to be be named Prasa. May they rest in peace. There are already many disingenuous headlines in the press, stating that the inquest has ruled medical mismanagement, following the denial of an abortion to Savita, as if the two events are linked. First of all, Savita was not denied an abortion, rather a termination of pregnancy. Though it may seem semantic, this is an important distinction. Though medically they both refer to the same end result, the term abortion is widely understood in the context of a woman who does not wish to have a baby. With women such as Savita, a termination of pregnancy is the more correct phrase, because the pregnancy and baby were accepted and welcomed. Savita wished for her pregnancy to be terminated swiftly when it became clear that she was miscarrying. She didn’t want to abort her unborn child, she wanted her miscarriage to be brought to a quick conclusion. 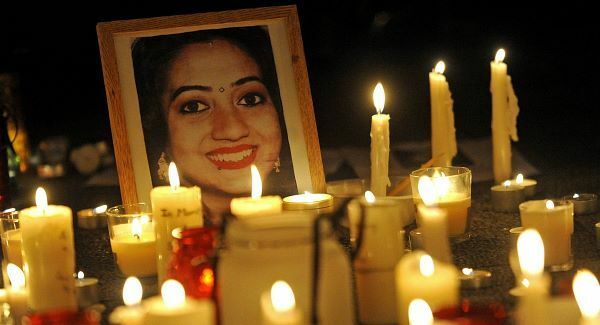 Savita’s request for her pregnancy to be terminated must be seen in the context of her miscarriage. The explanation given at the inquest, that this was not carried out because of the law, is an unsatisfactory one. The implication being that though there was a good medical reason to terminate the pregnancy, the law disallowed this. Dr Katherine Astbury testified that on the Monday and the Tuesday, Savita did not appear to be unwell, though she was emotionally distressed. In these circumstances, Dr Astbury is quite correct, Irish law would not allow for a termination to take place, because there appeared to be no risk to Savita’s life. This is actually fairly reasonable. Poor prognosis for the foetus would not allow for a termination, because Ireland rightly places equal value on all life, born and unborn alike. That someone has a poor prognosis is not grounds to kill them. Patients who are given a diagnosis of a terminal or incurable disease are not then killed because the outlook looks bleak and neither are the elderly, much as people might agitate for euthanasia. Whilst there is life, there is always hope and when we take into account the fact that Savita’s pregnancy was a wanted one, so long as a life is not deemed to be at risk, then it is not morally acceptable to kill an unborn baby on the grounds that he or she is as likely going to die soon anyway. The request to terminate the pregnancy from Savita, should not have determined what was in her best medical interests. All other things being equal, normal medical protocols dictate a conservative management (i.e. wait and see) approach. On a personal note, I can well imagine her distress and her physical pain. I was readmitted into hospital a week after my eldest child was born, suffering from retained infected placenta. When I apologised to the registrar in A&E for crying because I was in so much pain, his response was ‘madam, you have a uterine infection, it is going to hurt a lot’. In my case, despite my entreaties, they didn’t take me in for surgery for 4 days (it was Easter bank holiday weekend) preferring instead to administer IV antibiotics to cure the infection first and to see if the product would pass. Nine years on, I can still remember the pain vividly, but at least I was given the correct antibiotic treatment, though my desire to have a D&C and be back home was ignored. I can’t begin to imagine what Savita went through, especially when she had the ultrasound and could hear the heartbeat of her baby, whom she knew was shortly to die. It must have been awful for her and her husband, let’s not forget that. But this question of abortion or termination is nonetheless the source of much misinformation. Speaking at the inquest Dr Astbury stated that had she known about Savita’s blood results on Monday or Tuesday, then she would have taken a different decision and terminated Savita’s pregnancy forthwith. Which begs the obvious question, why didn’t she? We know from the inquest that the blood test results taken from Savita at 6.33pm on the Sunday evening were immediately processed and were available on the hospital’s computer system at 6.37pm. They were not accessed until 5.24pm the next day, by an unidentified member of staff and Dr Astbury herself did not look at them until 11.24pm on the Wednesday morning, by which time Savita’s condition had severely deteriorated. It is this delay that proved fatal for Savita. If a termination had been required, then Irish law allowed for this, the medical guidelines state that delivery of an unviable foetus may be expedited where there is real and substantial risk to the life of the woman. Sepsis would count as such a risk. Savita’s bloodcount was 16.9 (normal range 4.3 – 10.8) which should have rang alarm bells. She was definitely exhibiting signs of an infection which merited urgent further investigation which would have thrown up the presence of E.Coli. Real and substantial risk, are often confused with immediate. A woman does not have be in her death throes or dying for a real and substantial risk to be identified, simply that if a termination is not performed, there is a real and substantial risk that she will die. With hindsight, this perhaps was the case with Savita, as she was at risk of chorioamnionitis (inflammation of the foetal membranes), once the membranes had broken on Sunday. Once this has happened there is a 30 – 40% risk of infection, which is why she was prescribed general oral antibiotics on the Monday evening. Had Dr Astbury thought Savita was at risk of this, or was exhibiting signs, then why were no further diagnostic tests peformed, in this case an amniocentesis would have confirmed whether or not chorioamnionitis was present. Regular monitoring to identify trends in the white blood cells count is also crucial. What has confused the issue further is that Dr Peter Boylan, a doctor with a publicly stated position opposing abortion restrictions, testified as an expert witness stating that had Savita been allowed a termination earlier, it would have saved her life. It’s very difficult to know that with any certainty without recourse to a time machine. In any event the post mortem showed that it was the E.Coli bacteria that led to septic shock. The baby was not poisoning Savita’s bloodstream, though chorioamnionitis if diagnosed, requires delivery. If the baby had died then the placenta needed to be removed in order to halt the rapid of spread of infection spread via its dead blood cells. Bacterial chorio-amnionitis is exceedingly rare. What we do know though, is that in 40 years there have been 5 cases of septic abortions, no patients have died and Savita’s case was very rare. Every year in Ireland there are sadly 14,000 miscarriages, many of them carrying an infection risk, and no maternal deaths on record where the obstetrician felt that the law was inhibiting them. Dr Sam Coulter Smith, master of the Rotunda Hospital in Dublin, says that he has terminated a pregnancy in four instances where women had been diagnosed with sepsis and in all of them the baby did not survive. It’s difficult to see then, how Irish law can be said to be putting women at risk. The failure of Dr Astbury to discuss abortion outside of legal terms is what has proved troubling in this case. A surgical abortion would have carried with it real risks of further infection which could have proved fatal, and had Savita been given the drug misoprostel to induce delivery, this would not necessarily have made delivery any swifter or negated the need for surgical intervention. Faced with a fully dilated cervix and ruptured membranes, the medics could thought that delivery was imminent and there was therefore no need for further medical intervention at this point. They were therefore wholly wrong not to discuss this in medical terms with Savita and her her husband. Anyone would be cross if their request for a certain type of medical treatment was refused purely on legal grounds. What is important is that today’s inquest ruled that there was medical mismanagement in the death of Savita Halappanavar. The jury had the option to deliver an a narrative verdict which would not have attributed a cause. Despite the verdict which implies failures in medical care, the judge, Dr McLoughlin, has thrown further confusion into the mix by stating the verdict did not mean that deficiencies or systems failures in University Hospital Galway contributed to Ms Halappanavar’s death; these were just findings in relation to the management of her care. That seems to imply that there was nothing wrong with the general systems in place at University Hospital Galway, simply that the management of Savita’s individual care was unsatisfactory as we can see. One cannot help but wonder whether or not this is about offloading any legal liability that the hospital may incur in terms of compensation that might be due? After all, it was a galloping sepsis that killed Savita, stemming from the E.coli, ESBL bacteria that entered her bloodstream from the urinary tract and one that is antibiotic resistant. No-one can say with any certainty whether, even had the care been perfect, she would have survived this. Perhaps that is what the coroner is trying to convey, medical misadventure was a factor in relation to her care, but not necessarily in her death. It’s no wonder Parveen is still in the dark. What urgently needs to be addressed is the factors behind the poor care. Did the law really make Dr Astbury too afraid to check blood results, which needed further analysis or carry out further diagnostic tests? Was the law behind the lack of regular observations, the lack of communication and the failure to realise that paracetamol administered as a painkiller could mask other symptoms? Did the law cause staff to forget that infection requires a low burden of proof? Or was it the effects of austerity measures on an already overstretched hospital struggling with lack of resources? What caused the glaring omissions and can any law be expected to cover every single permutation that might arise in the management of pregnancy or childbirth, or is this simply that medical guidelines need to be more precise and explicit? Savita’s request for a termination to have been accepted and acted upon, simply by dint of her wishes. would have required Ireland to have legislation which is much more liberal than even that in the UK, which in practice, allows abortion on demand. It’s no wonder that the clamours for a repeal of the Eight Amendment of the Irish Constitution, (which defends the right to life of the unborn) have already started. None of which addresses the reasons behind the catastrophic failures in care. Savita’s treatment timeline can be accessed here. One thing that should be emphasised is how rare it is to have a miscarriage at 17 weeks. 0.5% of single pregnancies in women with no history of recurrent miscarriages end in spontaneous second trimester foetal loss. Sepsis is still thankfully rare. Whilst it should be on the radar as a possibility, most maternity staff will not be panicking about the possibility of sepsis when a pregnant woman presents with a UTI. In the incidence of a UTI, blood samples are tested and antibiotics administered. A normal reaction to a UTI would not be to terminate the pregnancy as a precautionary measure. UTIs are serious if left untreated but no medical protocols would consider them as a real and substantial risk to life. Even with a suspected UTI there was no reason (in the absence of blood results) for medical staff to believe that Savita was dying. I would be seriously concerned if any medic proposed termination of pregnancy as being necessary as a precautionary measure, unless it was in the most serious and grave of circumstances. Nowhere in NICE guidelines is termination mentioned as a treatment for a bacterial infection. Savita’s death should not prompt pregnant women diagnosed with a UTI to seek abortion and neither should they worry about contracting sepsis. One thing that should be remembered is the importance of scrupulous personal hygiene in terms of preventing the spread of bacteria such as E.coli. Excellent post. Would love to know what caused the miscarriage in the first place. Please come back to Twitter. Many people are missing you. I hope it would not offend the beliefs of Savita’s family to know that they are in my prayers today. May they know comfort in the midst of their terrible losses of Savita and baby Prasa. mother’s death was caused by sepsis also. What causes sepsis? I am praying that abortion is not introduced into Ireland. Read this in the Guardian and felt sick. Can’t people see that this has nothing to do with ‘a woman’s right to chose’? The last thing we want is for women to panic and insist that they want an abortion every time they get sick. This is a heartbreaking case. But there are heartbreaking cases of women who are advised to terminate an ‘non-viable’ pregnancy, only to discover that the doctors made a mistake and the (now dead) baby is perfect. Why do those stories only get into the Daily Mail? I think the lesson here is that I should stop reading the Guardian. It makes me feel sick every time.